I'm really pleased with the new design. When I say design, I really mean permaculture design, as it designed within that context. That means for me, the function of the space, comes first, rather than trying to make it immediately beautiful. I wrote more about how I came to making decisions on the final layout early November. Here is some area's of the new layout in more detail. I'm planning on growing French beans, and peas, up the obelisk, with my Aster to go in the middle of the obelisk. The Aster is autumn flowering, so my idea is that by the time the beans and peas are finished, I can remove them and let the aster have more space. It will be interesting to see if that works like I see it in my head! 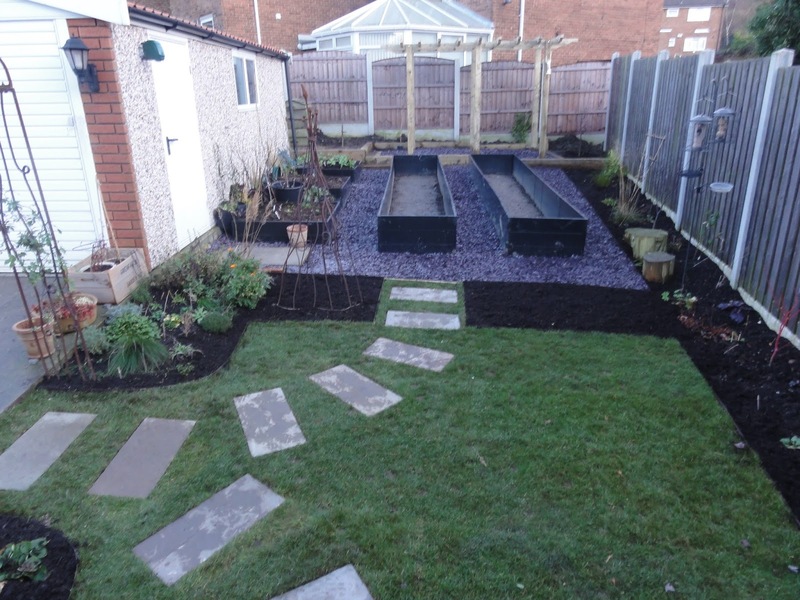 For the moment I've also added Crocus Pulchellus and Iris Reticulara J.S. Dijt around the outside of the obelisk. Closest to the conservatory is the Strawberry border where I've planted Crocus Sativus for autumn flowering and harvesting. 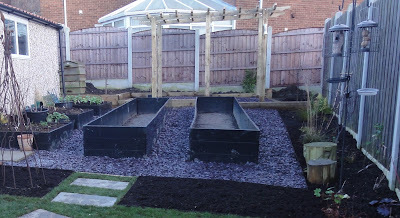 Then come the new long vegetable beds. Soil will be going into these beds early January. 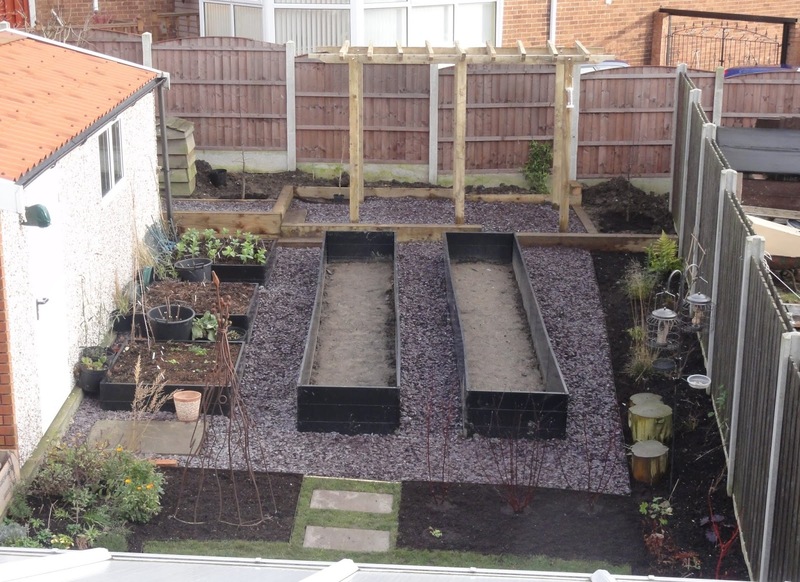 To the right is the rest of the shady border, where I've also planted the Morello Cherry - not easy to see just yet! I decided to turn all the paths into the area to shale rather than grass. Mowing around the vegetable beds is annoying, I know from previous experience (!) and I also wanted to keep mowing maintenance to a minimum. I think as vegetables and plants in the borders grow, it should be less in your face as it is now. At the back behind the garage, is the new retaining wall. This is to stop the soil from falling up against the garage, and also allow access to store some garden items out of the way until needed. An area has been paved in readiness for when I can afford to put in a large rainwater collection tank. The garage roof is a really large area and currently has guttering and downpipes with the water just washing away. This is also where the compost bins are situated. 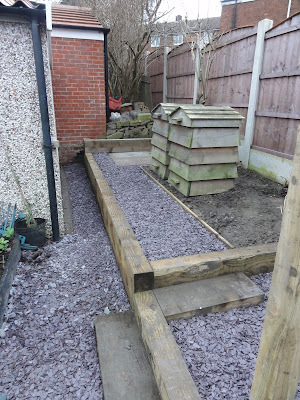 The new path means no more getting muddy when walking household scraps to the compost bins. Yay. The soil area next to the compost bins is where the Greengage is being planted. Next up is the new pergola. It's small, as I don't have a lot of space, and a simple bespoke style as none of the pergola kits that you can get would have fitted in. I'll be growing a dessert grape vine up the pergola and the idea is that over time it will create a better sense of personal space, instead of just seeing the neighbours conservatory. It will also be nice to sit under it in spring to autumn. I'm thinking about adding some fragrant clematis or other climber to help add to it's attraction as a place to rest. To the right of the pergola, the Damson will be placed, along with bluebells and pulmonaria to grow underneath it. 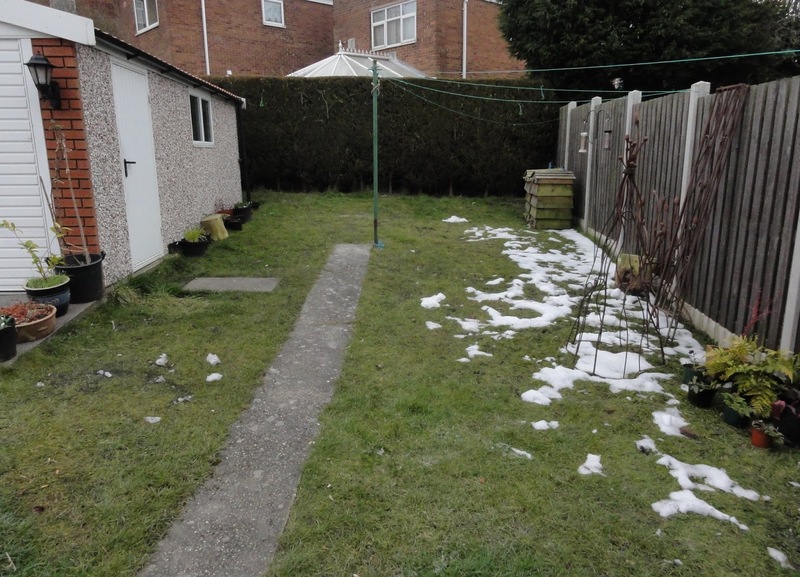 I did a lot of thinking about whether to keep some grass or not. During the summer, this area gets more shade than the rest of the garden and I found myself sitting there reading and relaxing. That decided it, I should keep some grass in the garden. Over time I'll probably add more spring bulbs into the grass to add further colour. There was a lot of angst (for me) and discussion with Nick, my landscaper, over the placing of the stepping stones. We need to be able to get from the conservatory to the drive way, and to the side garage door (behind the herb border) without getting wet or muddy. I didn't want to lay a full path of shale as in the other areas of the garden, as I felt this would start taking over too much. So the paving stones are the compromise. I think they stand out a bit at the moment, but should embed themselves in over time. 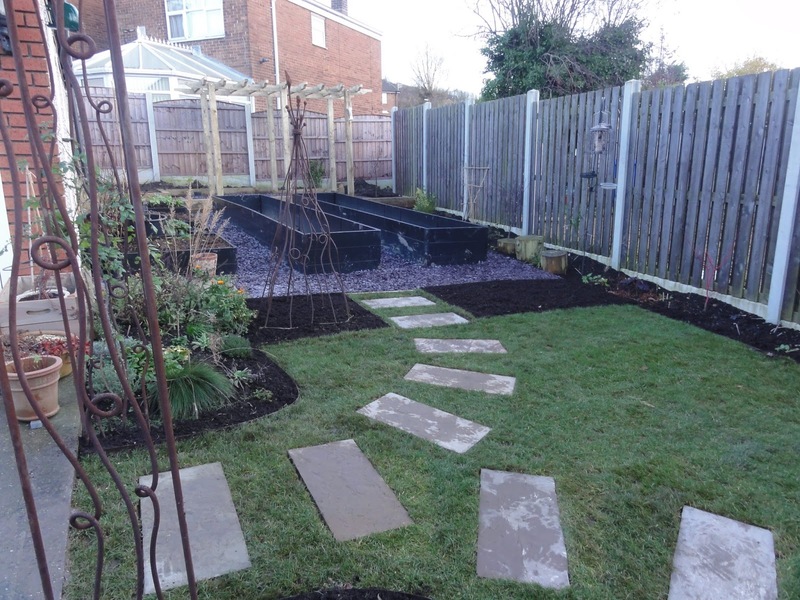 And as plants in the borders are added and grow, they should be less noticeable. The Cornus Border now has the cornus planted! I'm very fond of the dark red cornus stems so went for the darker stemmed Cornus alba 'Kesselringii' in the middle, with the light red Cornus alba 'Elegantissima' on each side of it. 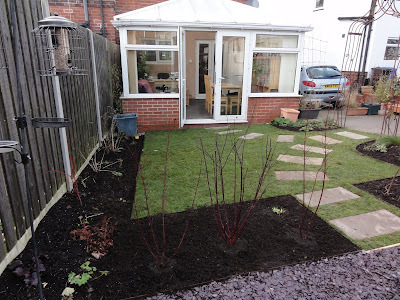 They have been under planted with Crocus Cream Beauty, which I thought would be a nice contrast to the red stems of the cornus, and Muscari Latifolium. I also planted more bulbs over the last few days in the Shady Border, including Fritillaria Melagris and Uva Vulpis, Crocus Sieberi Firefly, Scilla Nutans (or Hyacinthoides non-scripta, Bluebells seem to have two names) and Anemone Blanda Blue and Nemorosa. In the Herb Border I've also added Allium Atropurpureum. I'll be adding more hardy perennials, some of which are already on order from the Hardy Plant Society, and shrubs to the flower borders in future. 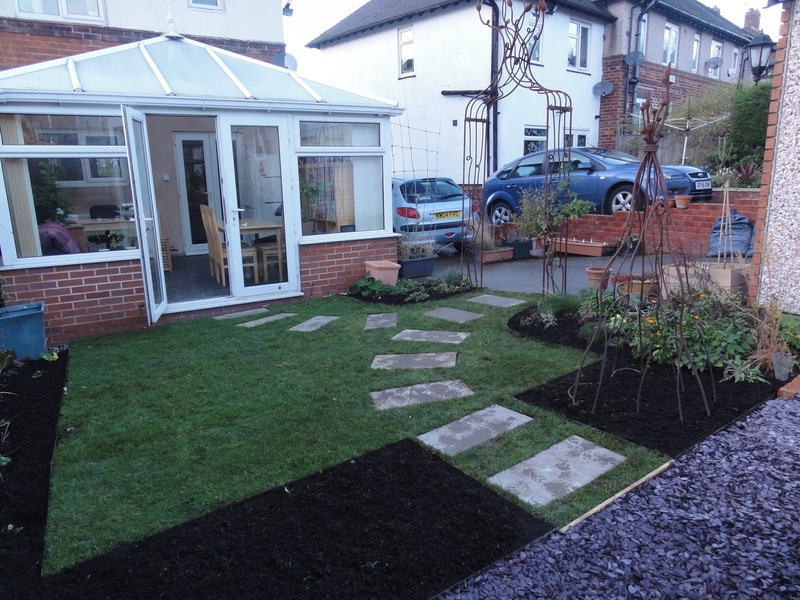 It's wonderful to have the hard landscaping complete. I now feel I can really focus on the growing in the coming year. 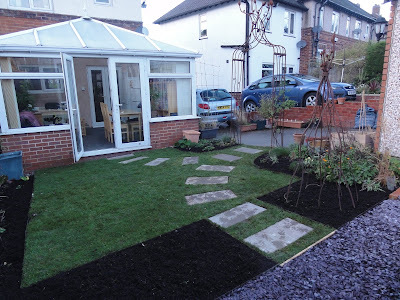 I've done a landscaping photo essay, giving a quick overview of each stage of the process. My landscaper was Nick Howlett of Howlett Garden Services, with the assistance of his sons Harry and Ben. I wouldn't hesitate to recommend Nick's services. As much as I tried to incorporate everything I wanted into my design, and as much as the landscaper can then plan for the work, things will always crop up that are unexpected, or that need to be reconsidered once work starts. 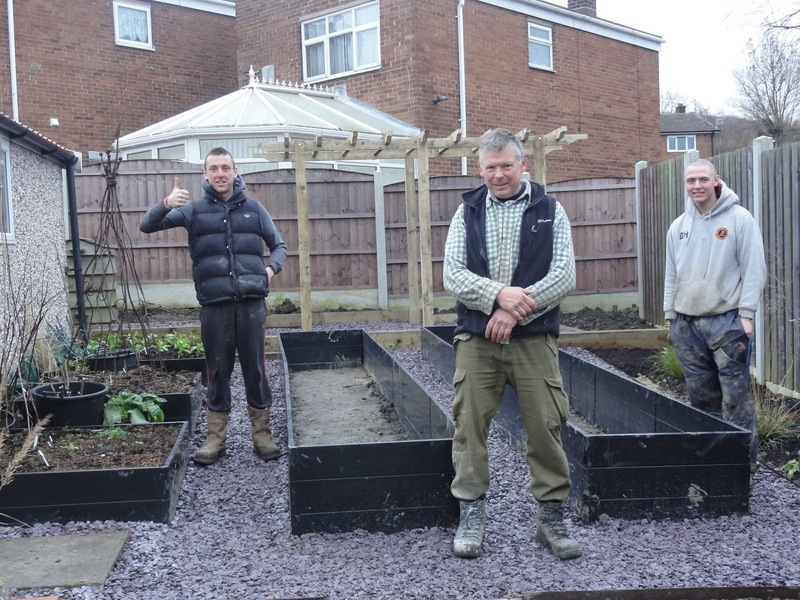 Landscaper Nick Howlett, with his sons Harry (left) and Ben (right). I was very impressed with the thought Nick paid to his work. 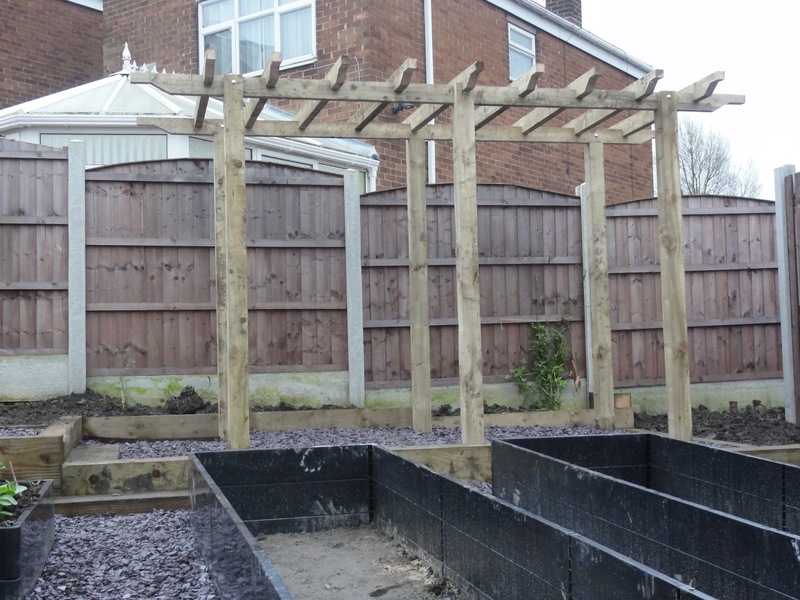 Whether it was working out the best way to build the retaining wall so it suited the site (which had all kinds of levels going any which way), to thinking to add the little details to the top of the pergola, Nick thought through everything carefully and the work was finished to a most pleasing attention to detail. 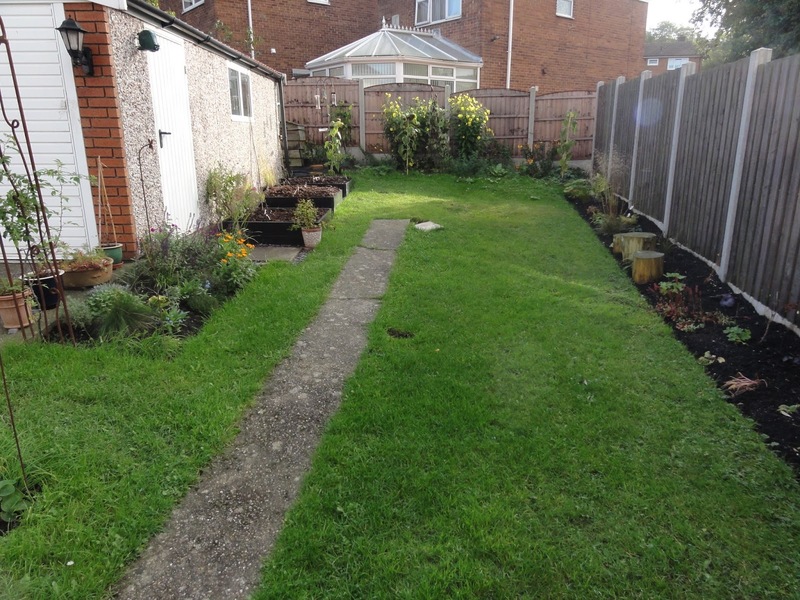 Once I've saved up some more funds, I'll be getting Nick and his sons to work on my front garden re-design!